I've now seen three Hunger Games films, and I feel confident saying that eventually, something is finally going to happen in one of them. There's been no shortage of incidents—action scenes, plot twists, emotional moments—but what's strange about this series is that everything always seems to be a precursor to something bigger and more ominous on the horizon. It's been an elaborate years-long process of stringing us along, watching and waiting and waiting some more. This is the way modern-day blockbuster franchises are designed—you watch the new film so that you know what's going on in preparation for the next one—but The Hunger Games has felt especially draggy and obligatory. Like with the first two films, Mockingjay - Part 1 has its entertaining bits and tense sequences. But everything is draped in a sense of foreshadowing: Wait till you see what happens next. None of these installments really holds up on its own. The new movie takes place soon after the events of last year's Catching Fire, which ended with Katniss (Jennifer Lawrence) being rescued by a group of rebels, including Plutarch Heavensbee (Philip Seymour Hoffman), and sent to District 13 to help plot the overthrow of the totalitarian government run by President Snow (Donald Sutherland). Convinced Peeta (Josh Hutcherson) is dead but at least comforted to know that the other man in her life, Gale (Liam Hemsworth), is alive, Katniss meets President Coin (Julianne Moore), the rebellion's leader, who informs her that Katniss is going to be the symbol for this uprising. Revolutions need a figurehead to project all their hopes and dreams onto, after all. 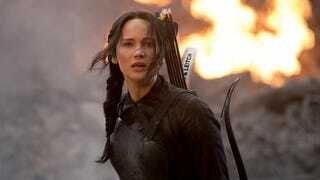 Mockingjay, like its predecessors, wants to offer some social commentary. But where the first two movies focused on attacking economic inequality and reality television, now we're on to media manipulation and the commodification of heroes. Katniss isn't particularly interested in being the face of a rebellion—she's mourning Peeta and emotionally recovering from back-to-back Hunger Games—but she reluctantly agrees because she agrees with the cause. That's just fine with Heavensbee and Coin, who skillfully and somewhat dispassionately turn her into a meme, shooting short propaganda films that star her as a warrior-hero leading a group of noble fighters who are digitally added into the background afterward. It's a nice little riff on recruitment ads and nationalist fury—probably the smartest of its kind since Starship Troopers. More importantly, it's also a mark in this franchise's favor that while these movies are partly about the age-old narrative device of the little guy/gal overthrowing the mean empire, its makers (including original novelist Suzanne Collins) view the mechanics of rebellion with a fair amount of clear-eyed ambivalence. We don't necessarily think that President Coin is some ethereal, benevolent creature who will bring balance back to the fictional land of Panem: She's simply less terrible than Snow. But like much of Mockingjay, this dim view of rebellion is merely an idea that's thrown out perfunctorily, giving us something to think about for a second before we get back to the business of ominous doom and will-she-or-won't-she romantic melodrama. Katniss discovers that Peeta survived: He's become a talking head for the Capitol, telling viewers not to support the rebellion and that the once-beloved Katniss is now a traitor who has lost her way. (Both sides of this conflict know how to spin their agenda.) And so, we get another round of Katniss hemming and hawing between her two men. In a short time, Lawrence has proved her depth and versatility as an actress, but the longer the Hunger Games juggernaut goes on, the more convinced I am that this is her least-interesting work. (I even prefer her smaller role in the recent X-Men movies.) She's certainly not bad here, but her character does her no favors: Where once she was a rural gal who had to find her voice on Panem's biggest stage, now she's ... well, that's still what she's doing. There's not much growth or change to Katniss, just an escalation in her anxiety and personal trauma that forces Lawrence to get more and more unhinged. The actress brings empathy and grit to a part that is starting to feel beneath her. Mockingjay, like Catching Fire, is directed by Francis Lawrence, who has a knack for this universe's increasingly dark dystopia. (He also directed I Am Legend, one of the best post-apocalyptic films of the last 10 years.) This one isn't as bleak or scary as that Will Smith movie, but it's also not as visually inventive or suspenseful, either. Draped in blah blues and muddy green-grays, it might as well be set in that underground lair from the Matrix sequels: That seems to be filmmakers' default look for "See how bad the future is?" With the exception of a terrific crosscutting sequence near the end, Lawrence doesn't bring a lot of pizzazz to these new proceedings. Everything is competently done and well-acted—Hoffman is especially good, which compels you to relive his real-life tragedy all over again—but it's hard to warm up to Mockingjay - Part 1 when you know it's merely setting the table for next year's Mockingjay - Part 2. This whole series has been building, slowly and without a lot of distinction, to next year. The Hunger Games is not the only franchise that's done this: Depending on your temperament, you might feel the same way about Harry Potter, The Hobbit, or Twilight. Too often now, we're seeing movies only so that we can be ready to see more movies later. In its own way, that reality is a dystopia all its own.